Mystery, friendship, and a grand adventure. Melanie and her friends set off to break the Mardi Gras code. They chase clues throughout the season’s parades, sneak into forbidden float barns, and even join forces with the intriguing boy who lives down the street. 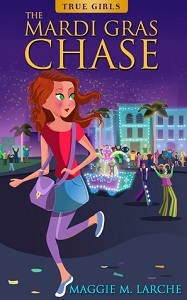 The Mardi Gras Chase is the first of the True Girls series from Maggie M. Larche. If you like stories of girls with heart and intelligence, plus a touch of romance, you’ll love The Mardi Gras Chase! Try this fast, fun read today! ‘The Mardi Gras Chase’ was a book I was not expecting to like as much as I did. I mean it is for a much younger audience and, at best, I thought I would be amused by their antics. But damn the author has done a brilliant job! Melanie, Kate and Faye are three friends who study in the same school and live near each other. One day Melanie notices that a letter is upside down on a float in the Mardi Gras parade. She’s curious and starts noting down all the odd looking letters and is determined to crack the code. Her friends initially think that it was just a mistake but her excitement manages to get them interested and soon they’re running all over town, trying to crack the Mardi Gras code. School, Chores, Family and baby sitting has to be juggled but they work at it until…..well I won’t tell you the ending. This is reminiscent of ‘The Famous Five’ or ‘The Secret Seven’. I found myself eager to see what was happening next and although I kept putting off reading this for quite a while, when I did get started I was hooked from page three. It’s very well written with each person’s character and personality clear. I know what Melanie would like and what Faye is like and what Kate will do! It’s great to see such steady clarity in a younger book. I’d always assumed that Enid Blyton was the best that was ever written but it might just to time to admit that there are other books around that are book. I must admit though that based on the target audience that fact that there’s a love interest actually creeped me out a bit. I removed one star for that. But that was one of the creepiest parts of the book. I kept thinking “These girls sound too young to have a love interest or too stupid for their actual age which is why they seem so young.” I’d suggest checking out that portion if you want to before letting your younger kids read this. Apart from that one gripe, I’m thrilled with this. Maggie M. Larche loves to sing, read, and swing right alongside her kids. All of her stories feature courageous, smart, funny kids, because that’s who her readers are! She is the author of the award-winning Striker Jones series, a groundbreaking approach to teach economics to children through mystery stories.